The "Pythia" plan which was apparently designed in the framework of eventually assassinating former Prime Minister Costas Karamanlis and destabilizing Greece's economic, political and social life was under the microscope recently by several blogs, that argue that there is new evidence that can possibly crack this case wide open and send a multitude of "gangs" and shady figures to jail for literally destroying Greece and its people. This includes politicians, journalists, publishers and bankers! A lot has been written about the fall of the Karamanlis government. Some magazines, such as Epikaira, or web sites such as olympia and newsbomb, even went as far as exposing details that were unknown by the general public. Every single story had two things in common: One, they all confirmed -with classified documents- that there was indeed a very threatening plot to destabilize Greece's political leadership at the time because of its ENERGY policy. And two all the reports spoke about foreign interests behind this plot. Unknown until today, there were other reasons for the the fall of the Karamanlis government that include direct threats by a foreign Ambassador to a Greek government Minister. If you sign it, you will fall - This is the message the government of Karamanlis received in April 2008 so that it can stop moving ahead with its energy policy which we all know would have benefited Greece greatly. In fact if Karamanlis was allowed to pursue this energy policy it would have made our country into a powerful energy hub, and a fair player in the global geopolitical game. 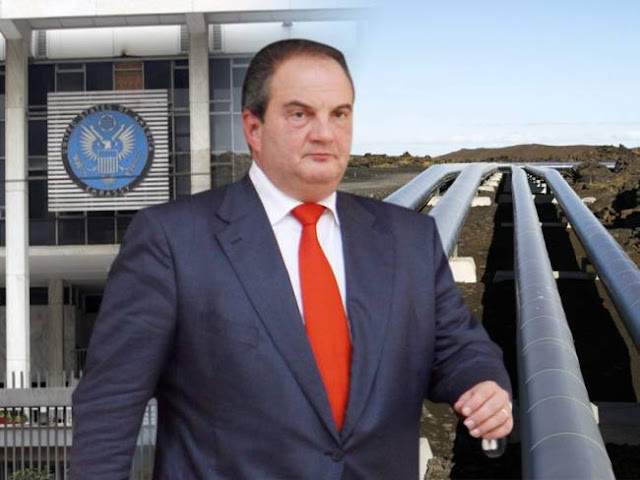 But unfortunately Karamanlis' pipeline diplomacy, which included the Bourgas - Alexandroupolis pipeline, drew much discontent and many threats were made against his government that we all found out later were actually part of a broader plan titled "Pythia". First Phase: Political instability. During Karamanlis' run as Prime Minister, the political climate in Greece began to crumble and the mainstream media (which some hint sold its soul to hostile interests) suddenly began broadcasting stories suggesting that the government of Karamanlis was accepting kickbacks or was involved in money laundering such as in the case of Monastery of Vatopedi. The news began to slowly tarnish the image of Karamanlis’ Cabinet, while the aim was to strike at the core… In other words, Karamanlis himself, so that he could lose his credibility with the people. It took a while, but it worked. After months and months of propaganda, people turned their back on Karamanlis, his political career was totally tarnished, and he lost the elections to George Papandreou in October 2009. Second Phase: Economic unrest: This was achieved with various methods that even included the various kidnappings of several prominent businessmen, and especially throwing the business community in a panic and complete chaos. Third Phase: Social instability. This was implemented with various forms of social unrest, including violent riots and terrorist acts. The huge deposits of natural gas in Greece's subsoil, coupled with the expected privatisation of DEPA -with intense Russian interest- is apparently not appreciated by the same parties (and papandreou regimes) that want (and have always wanted) Greece to remain idle while they loot our very existence. Until now, even we here at HellasFrappe believed that West began to turn its back on Greece when Greek policy makers decided to move ahead with the Bourgas-Alexandroupolis pipeline. Today we found out, through a shocking confession, that the plan to destabilize Greece, because of its energy policy, was actually because of the underwater gas pipeline project Novorosinsk - Bulgaria. The key here are the words NATURAL GAS and as we all know by now Greece has a lot of it. The central figure in this case is none other than the former minister of development, Christos Folias, and his confession is of massive importance in this investigation. Folias states that he signed the agreement for the underwater gas pipeline Novorosinsk - Bulgaria in April 2008 with Russian officials. According to him, this deal had two parameters. The first was that the pipeline would be aimed at the heart of Europe, passing through Hungary - Austria. Secondly - and certainly of massive importance- it would have passed through Greece and Italy. Just 15 days before the signing ceremony -in March 2008- Folias accepted an invitation to meet with the US Ambassador in Athens and was shocked and dismayed when the diplomat told him: "If you sign this specific contract, you will come into opposition with the supreme national interests of the United States. And it is something that we will not allow to pass". Disappointed and dismayed, the Karamanlis government was not intimidated and continued with this dynamic national plan, and the events that followed are now known to all. Just several weeks later, or specifically between April 20-25, 2008 foreign assailants made their first attempt against Karamanlis' life. Soon after the Pythia plan was uncovered by Russian intelligence agents and the rest is history. Unknown to some is the fact that Karamanlis, despite the threats to his life, was determined to move ahead with projects that would have given Greece the development it needed to broaden its wings in the global market. But he was not only faced with foreign interests that went against these plans, but their agents in Greece who were used to discredit and belittle his work and his government. One example of this is the Vatopedi case. This case dominated the interest of the media for many reasons. It had it all, mystery, religion, wealth... What people are unaware of is that this case began as a blackmailing scheme set up by several local extortionists in northern Greece, but then was used by the Papandreou regime as a tool to discredit Karamanlis. Once in their hands the whole issue blew out of proportion and with the help of international news networks, the mud-slinging began. Also, soon after the signing we also witnessed the sudden fleeing of Mr. Christoforakos - or the man of Siemens-. And then later on his sidekick Mr. Karavelas also dominated the news. What people do not know is that both these men are very good "friends" of the West. (This of course under the watchful eye -Editor clearing throat- of the then Foreign Minister Dora Bakoyiannis who we all know was -and still is- one of Karamanlis biggest rivals and a very good friend of the Bush family). We also witnessed the total destruction -or burning down- of the prefecture of Attiki in 2009. During this period the Greek media would feature tacky images of George Papandreou surveying the areas that were burned, but what they never showed was his escapades to the beach and his canoe rides which were held before and after the cameras would stop rolling. And certainly how can one forget the infamous line "Socialism or Barbarity" at every single speech he gave to show how fed up people were with Karamanlis' tyranny. Also, other strange events occurred during this period as well. According to the news sources below, the leadership of the Consul in Thessaloniki suspiciously wanted to extend his term, and what is even more interesting is the fact that there were many frequent -and mysterious- visits to Mount Athos that were being conducted then and of which were kept extremly hush-hush. And here is another fact that was noted, and although we expected it, we were shocked nonetheless that they are finally reporting it. Everyone associated in this plot was handsomely rewarded VERY HANDSOMELY. In fact publishers who would literally whip the Karamanlis government from the morning to the night in their newspapers, their radio shows and especially on television suddenly enjoyed very generous "sea loans" (from the same banks we just bailed out), while HUGE names in the media and smaller media companies saw their cases with the justice department being miracoulously filed (in other words CLOSED), and so on... and so on. The only losers in this damn play was Greece and her people who not only went from riches to rags within a few months, but almost became a total protectorate of foreigners. The point of this article is clear. Folias' confession to newsbomb has to be questioned by authorities because it is the missing link needed to tie this whole case together and finally bring those involved to justice. It is inconceivable how this has gone unnoticed by those investigating the case. Lastly, to all of those wannabe journalists -domestic and foreign- and artsy-fartsy columnists who continue till this day to slam Costas Karamanlis by characterizing him as a joke, or the weak and lazy one, we would advise them to really stop doing so because the biggest prank by far was on them for endorsing and promoting a man that eventually destroyed our nation, its people and its social life... namely George Papandreou. This corrupt media regime must finally be exposed because they deserve to be punished. And we saved the best two issues for last: One, the sudden confession of the Deutche Bank confirming what has been common knowledge in scientific communities for years about Greece's natural reserves, and two the developemtns in the privatisation of DEPA and the interest of Russia to become an investment force in our country. Will the present leadership allow all these "interests" to seize our wealth, or will they finally stand tall and proud and scream out "enough"! Karamanlis did, but he lost the support of the people and therefore could not continue. And this is because when a leader has the support of his people, he can fight entire mountains. Take the example of Hugo Chavez when a staged coup was set up to overthrow him several years ago. If it wasn't for the love of his people, Chavez would have never returned to power. In regards to public opinion, unlike the days of Karamanlis the present government will not be belittled by the same agents that were used to discredit the former premier because quite simply they are terrified of being exposed for all their dirty dealings. Their "sea loans" are now public knowledge. Also, the word "patriotism" has become fashionable again, unlike the past where it was looked at as being bourgeois, and today there is an unyielding attitude to defend the flag at all costs thanks to the extremities of the far-left which went on overdrive after Papandreou came to power. Of course things are also different today because of the information that is being generated by the alternate media and of which has allowed citizens to finally educate themselves about subjects that up until yesterday sounded more like conspiracy stories rather than the truth. Think back to more than one year ago when HellasFrappe began speaking about Greece's EEZ or the amount of gold in Halkidiki. People thought we were on acid when in fact we were just well read on subjects that were ignored by the vast majority. To this end, all of us have an obligation to defend Greek national interests because the future and survival of this country lies in our own two hands. If the government decides to finally take a stand for the benefit of this country we must defend this position at all costs. This includes our Diaspora in North America and Europe. HellasFrappe Archive - Was Mossad, MI6 & CIA Behind Assassination Plot Of Karamanlis?